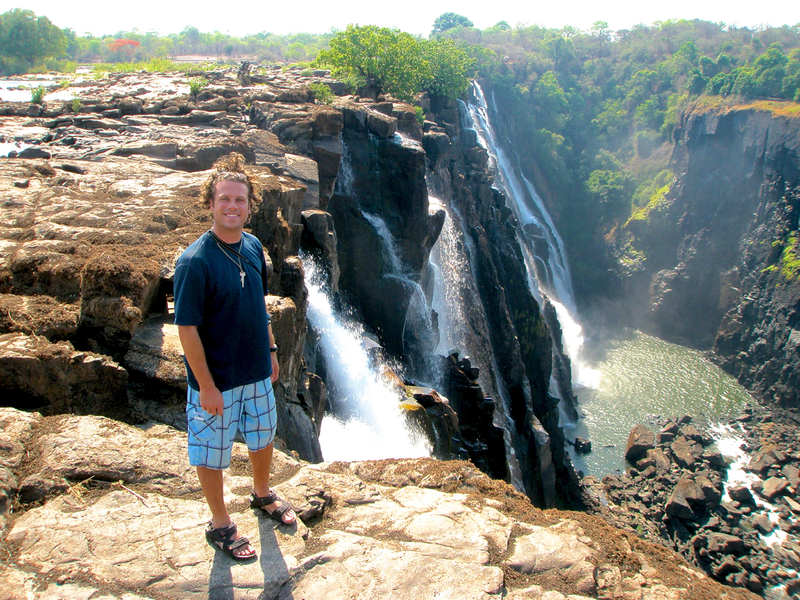 While staying in Livingston, Zambia, we had the opportunity to take a walking tour along the rim of the famous Victoria Falls, one of the largest waterfalls in the world. We were in Zambia during the dry season, so most of the upper falls were accessible on foot, and the lack of water presented a chance to take a dip in the Devil’s Pool- an eddy pool located right at the edge of the falls that is only safely accessible during the low water levels of the dry season. I figured it was a great way to get to see the falls from above, and the experience of swimming right at the falls’ edge was supposed to be pretty exhilarating. 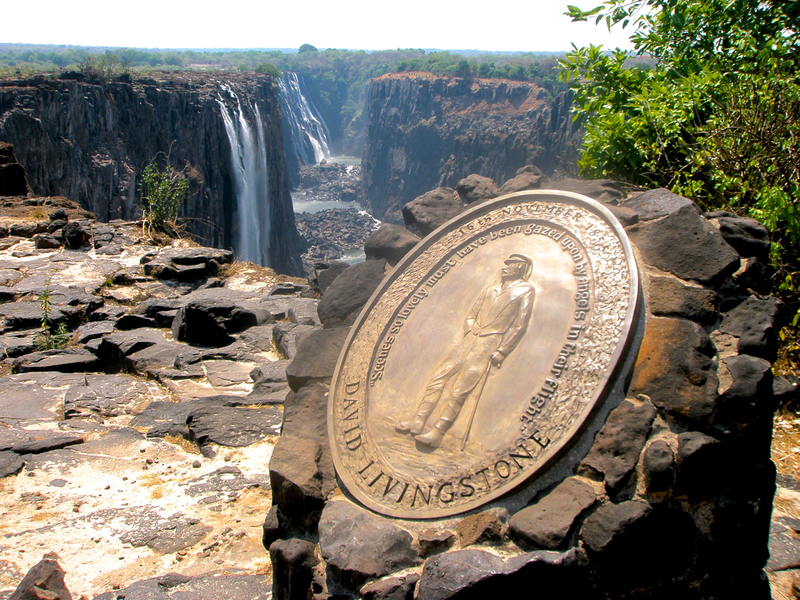 The hike would include views from several lookouts above the falls and a visit to Livingstone Island- named for the infamous Dr. David Livingstone, the first Westerner to view the falls- all under the watchful eye of a local guide. Excited about the day and our first introduction to Mosi-oa-Tunya- “The Smoke That Thunders” in local dialect- we crammed our towels, sun cream, and swimmers into our daypacks, and headed out to the front of our accommodation to wait for the transfer van to pick us up. 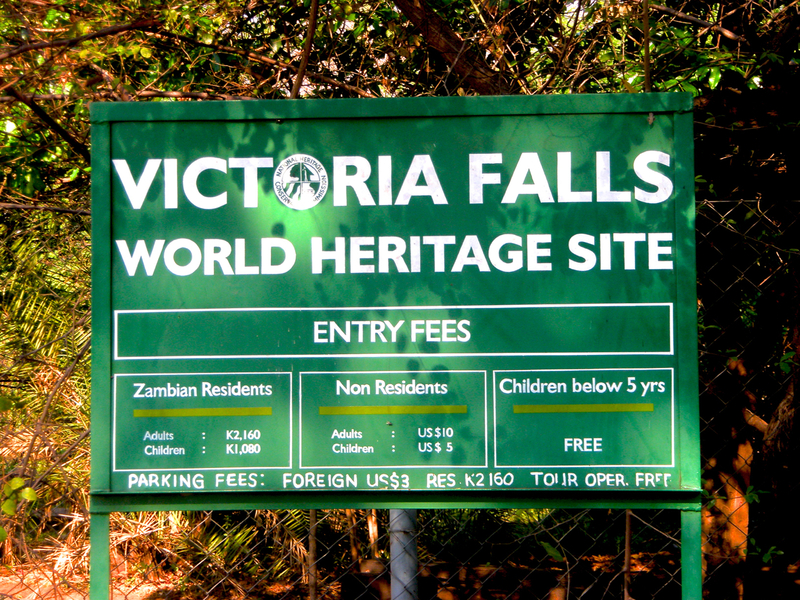 After the short drive over to Victoria Falls National Park, we met our guide, and set out on our hike. The walkways within the park itself were well-kept, with safety railings and fences set up to prevent people from getting too close to the edge. We meandered along these paths for awhile, never able to catch a glimpse of the falls, but constantly hearing their roar through the trees. It was amazing to think that we were there during the dry season, and that the falls were at their lowest level of the year, yet still thundered so loudly. One could only imagine what the sound would be during the peak of the wet season- incredible. The anticipation grew thick as we continued our trek through the forest at the edge of the falls. After several minutes of this, and at the urging of our guide, we holstered our cameras and continued our trek up through the paths of the park to the top of the falls. We caught a few more glimpses of the gorge through the trees as we climbed, and eventually came into a clearing on the plateau above the falls. The ‘delta’ of the Zambezi spread out before us, each little stream purposefully making its way towards the rim of the gorge, small islands of rock and grass spotted here and there amidst the flowing waters. It was hard to imagine what the serene scene we were greeted with would look like in the height of the wet season- it must just be a virtual avalanche of water pounding through, around, and over the rocky outcroppings and small islands in its rush to the gorge and the rumblings below. Immense, to be sure. Once again, I was glad to be there during the dry season, when it was safe to simply join hands in a human-chain and make our way across the seasonally calm tributaries. We could still see the mist rising in the distance, and though fainter now, could still hear the rumble of the falls. Slowly but surely, over rocky islands and through shallow streams, scrambling here, jumping there, we eventually made our way out to the rim of the gorge. We were now on top of the falls, peering cautiously over the rim down into the chasm below. Our guide was sure to keep us from getting too close to the edge- true or not, we had already heard stories of those unfortunate enough to get one step too close to the edge… A terrifying thought when standing on the brink of such a tragic end. It was enough to get me to keep my distance, for sure. Even then, there were several spots along the rim where we could get great views of the gorge as it extended in both directions. The drop was difficult to fathom, the floor of the gorge being so far below. We did see some whitewater rafts in the river below, which gave us a bit of scope, but that only made my stomach churn all the more. 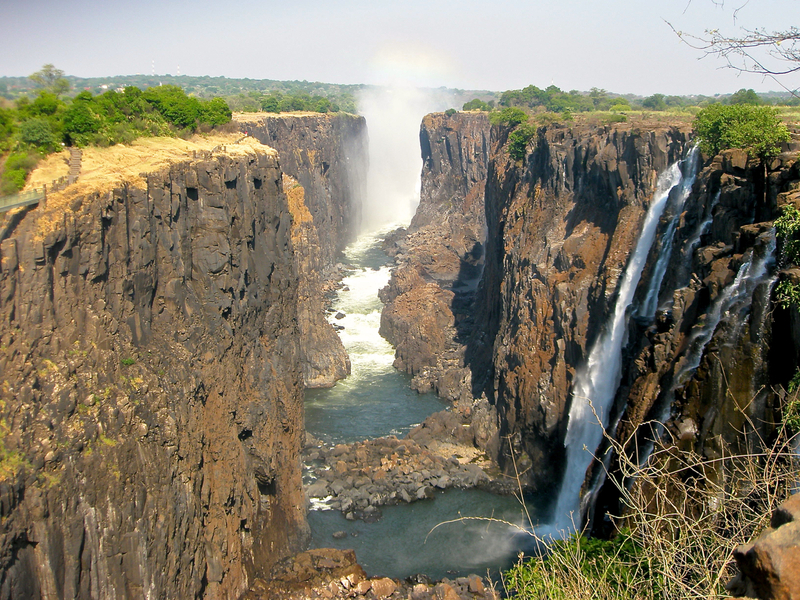 As we meandered along the rim, our guide pointed out the different falls still flowing in the dry season, and told us a bit about the history of the falls and their ‘discovery’. Along the way, we came across an historical plaque that supposedly marked the spot from where Dr. Livingstone first viewed the falls. From there, we could see around the corner into the other half of the gorge- the half where the water was still flowing- and were greeted by the amazing sight of the powerful Zambezi plunging over the edge and roaring down into the valley below. It was INSANE- there was so much water rushing over the edge of the cliffs that it seemed as if someone had turned on an enormous fire hose and had aimed it down into the canyon. The air was heavy with water vapor, and the sunlight cast multiple rainbows across the gorge below. It was incredible- indescribable… Again, no matter how many photos were taken, they would never capture the beauty and power of the scene. 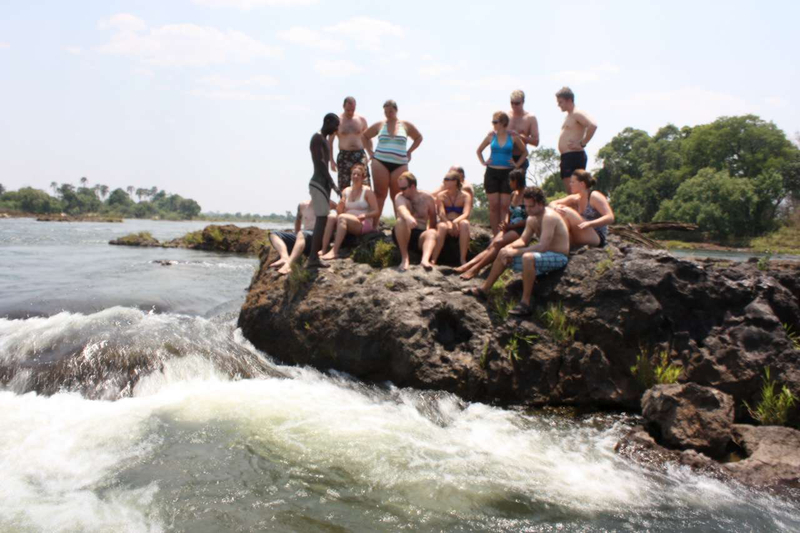 Finally, we came to Livingstone Island, and changed into our swimmers to take the plunge into the Devil’s Pool. Once again, we had to create a human chain as we walked/swam across one of the larger tributaries and out to an outcropping that was the entrance point for the pool. We had handed our cameras to our guide, and watched in amazement as he hopped his way along a chain of small rocks right at the edge of the falls and out to the island we were headed for. Obviously, it wasn’t his first day on the job… Slowly, we swam against the current and out to the island, helping each other up the slippery slope and to the edge of the pool. Water was rushing all around us, pouring out and over the rim of the canyon and down into the depths below. We had to shout to each other to be heard above the thunderous waters- it was awesome. Our guide had positioned himself at the edge of the pool, cameras in hand, and held each up in succession, signaling who’s turn it was to take the leap into the eddy at the edge of the tumbling waters. There was another local in the pool as well, ensuring that we jumped in at the right spot and didn’t go spilling over the edge with the rest of the river. One by one, we took the plunge- a deep breath at the edge, a final glance at the intended landing point, and then… GO! The pool was probably about 6-7 feet deep, as my feet barely touched the ground when I jumped in. 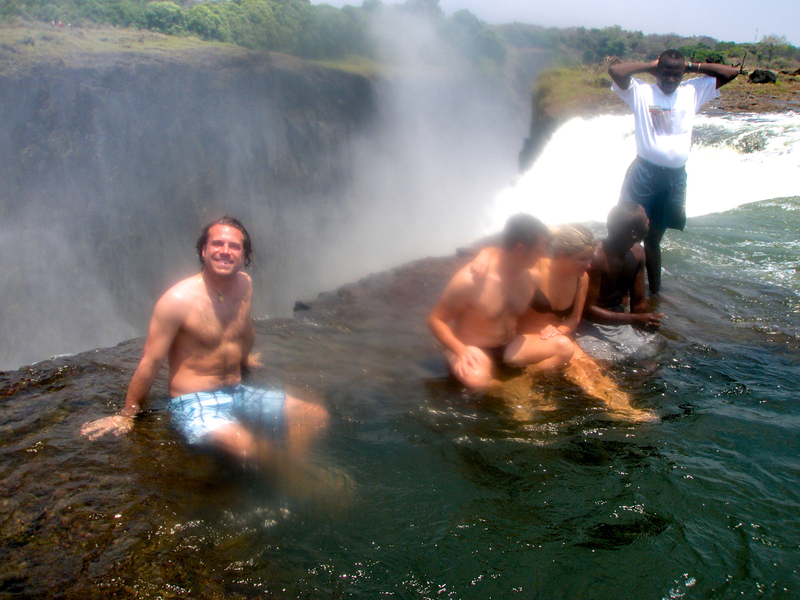 The water was warm, and I had no trouble making my way over to the far side of the pool for the requisite picture of me sitting on the very edge of Victoria Falls, the mighty Zambezi tumbling into the gorge just over my shoulder. It was pretty awesome, sitting there on the edge of one of the largest waterfalls on earth, the river pouring in, around, and down all around us. I had to take one look over the edge, so laid on my stomach and peered over the brink. Whoa… The power of the falling water and the distance to the valley floor below was overwhelming. It was one of those instances where you can only take the feeling of vertigo for a few seconds before you have to look away- incredible! Besides, I knew there were others in the group that were waiting for their turn at the edge of the falls, so reluctantly, I vacated the seat and swam back into the pool to make room for the next person. It was only a brief glimpse, but it was a view and a feeling that I will never forget. After a bit of splashing around, it was time to head back, so we made our way across the river and back to Livingstone Island. It had gotten HOT as morning had given way to the midday sun, and we all had a drink before embarking on the trek across the delta and back to the path that would lead us down to where we had begun our adventure. All wanting to get down into the forest and out of the sun, we made short work of the return trip, and before we knew it, were back at the Park Center, waiting for the van to pick us up and take up back to our campground. It had been an amazing morning, and a great introduction to the incredible Victoria Falls.